Another ACORN from the Obama-Biden Tree of Deceit and Fraud? Everyone has known for a long time that Joe Biden is a plagiarist. That inconvenient truth was exposed a few years ago during an earlier, failed presidential campaign. Thus, some were surprised when Barack Obama selected Biden as his running matter. Biden`s honesty, judgment, character, and literacy were sure to be questioned during the heat of a close race for the White House; so why provide the opposition with answers not favorable to the ticket? 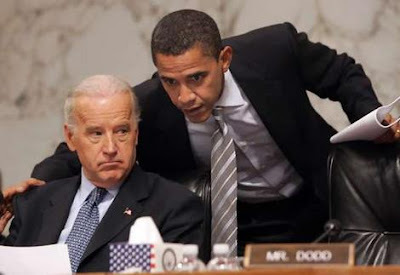 As it turns out, Barack Obama may have been cavalier about Biden`s unethical abuse of the written word because of similar skeletons lurking about in the Messiah`s own closet. Read Cashill`s entire article at the link below. If Obama and Biden are so flagrantly dishonest when it comes to writing as it appears, is there anything that either one says or does that can be taken at face value? Or is this yet another ACORN falling from the Obama-Biden tree of deceit and fraud?